Following, preserved as part of Ascension history, is the beautiful event created by Laura De León. The 11:11 time has also become a daily time across the world for wishing. Indeed, there are many more ancient and scientific signals of the power of the 1-ness of the number 11! Come learn more about this incredible time in the EARTH’S history! Join Us For An All day, and ALL Evening, CELEBRATION featuring: FREE Workshops, World Renowned Speakers like acclaimed UFO expert RENATO LONGATO, famed ET healer JACKIE SAVITTI, Grammy Nominated Performance Artist AROS CRYSTOS. Live Music by ‘PHILIPPO FRANCHINI and ALCHEMY’, Sacred 11.11.11 ACTIVATION, Angel Visions by Founder KEN SHEETZ. 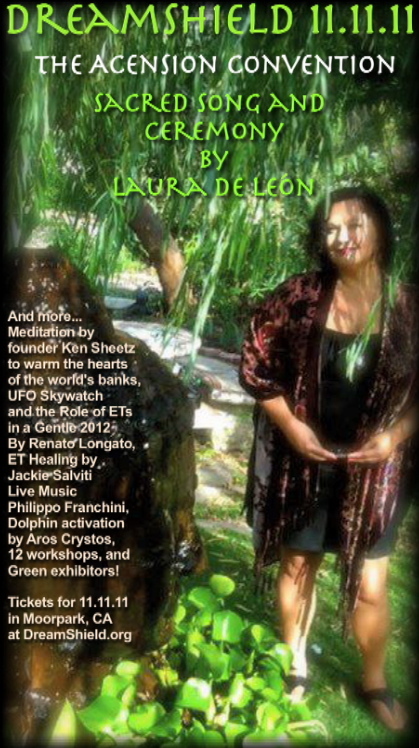 Meditations, Sacred Ceremony and Original Music with Founder LAURA DE LEÓN. LiveStream Spiritual Radio STARS Broadcasting onsite. DANCING under the FULL MOON & STARS, Compassionate, Gifted HEALERS, Friendly Aliens, & MUCH MORE, all in a tropical paradise of setting, Rancho De Las Palmas. Let’s Co-Create and CELEBRATE This Magnificent Day Together as One! Click the poster to order early bird tickets and save up 40%! Our amazing venue. Rancho De Las Palmas, is a Sacred Tropical Paradise with Giant Crystals embedded into Stunning Fountains and Stone Art. Sparkling Waterfall. Expansive Lilly Pond with Swans, Ducks, Turtles and DOVES. Covered Pavilions. Exotic Trees and Plants throughout the property. Ancient Sacred Symbols embedded into walls and stone walk ways. In beautiful Moorpark, CA Just up the 101 Freeway east of Malibu. Easy access. Abundant FREE Parking. Delicious and Hearty Vegetarian, Raw and Vegan foods & yummy beverages will be available for purchase through-out the event. : ) Also, Some of LA’s Best GREEN Vendors. EARLY BIRD TICKETS: $65 ONE price gets you into ALL Work-shops, ALL Speakers, ALL LiveStream Radio Shows LIVE, Yoga Classes, Performance Artist, Live Music Performances, Dancing Under the Stars and All Sacred Meditation Ceremonies. ♥ Yoga Classes throughout the day. ♥ LIVE MUSIC Throughout the evening. 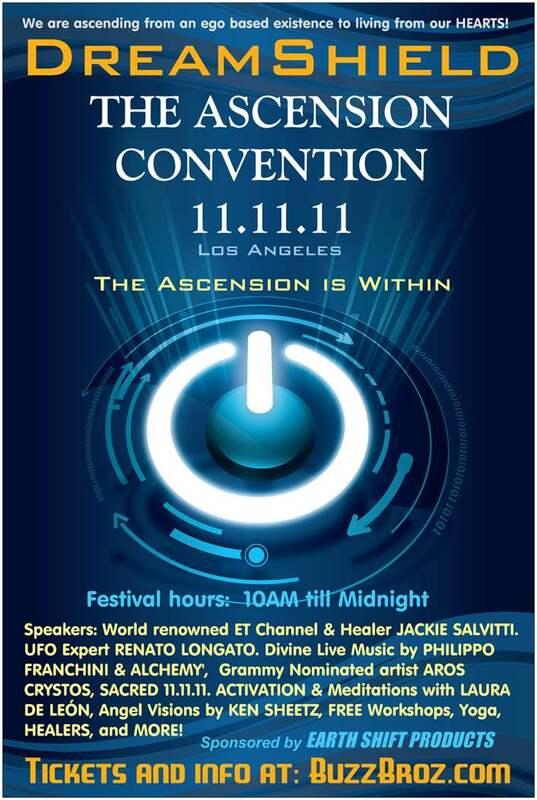 ♥ 11.11.11 Activation Ceremony ‘OPEN TO RECEIVE THE LIGHT” begins at 10PM. Expanded list of more Loving Edge Speakers, Workshops, Performers and Entertainment to follow. We are looking for Green and Conscious VENDORS for Vegetarian, Vegan and Raw Food. Contact Laura De Leon at: dreamshield@me.com. for pricing and information on how to be part of this MAGICAL day. All about the 11.11.11 day of magical events in one video! Now take a sneak peek at our amazing Rancho De Las Palmas venue . Big thanks to LA location sponsor EarthShiftProducts.com! Early bird tickets on sale now at BUZZBROZ!